Benoit, this is my first international interview; thanks for agreeing to answer our questions! Tell us a little bit about life in Luxembourg, and what the gaming culture is like. I’ve worked and lived in Luxembourg for 7 years. In Luxembourg people enjoy getting together after work to relax and have fun… So that’s a great place for gaming. How did you first discover gaming; what game got you hooked? I discovered gaming with RPGs such as Dungeons & Dragons, and then Magic: The Gathering. Then I started extensively playing board games such as Agricola. Tell us what games you find yourself playing the most of late, and why. I currently play games like Ascension, Zombicide and Quarriors. I enjoy these games because they are fast-paced and there are not a lot of rules to learn. So what gave you the idea to design Mythic Battles, and how did you and Pay & Win Games come together to get it published? I enjoy strategy and confrontation games. I designed Mythic Battles because, with my job and family life, I could no longer dedicate a lot of time to learning new games. In addition, most confrontation games require spending quite a lot of money to play them. So I had three goals with Mythic Battles: I wanted to deliver a real strategic game, with little impact of chance. It is easy to learn, and more accessible than games of the same category. Finally, for 40 euros you can afford a game with two complete armies. What is it about Mythic Battles that makes it unique compared to other games of the same genre? I think Mythic Battles is unique as it is a new kind of game: a BBB (Board Building Battle). The game takes place on a gridded board (Board) on which units move. There is a strong deck-building side because the constitution of armies is like building a game in Magic The Gathering (Building). Finally, it is a battle where strategy is a key element (Battle). In Mythic Battles, are there defined roles for the armies…such as good guys and bad guys? Or are the lines between good and bad blurred, and less defined? Do you think today, in the real world, there are still good guys and bad guys? Or are those lines blurred? The same way as Mythic Battles, I think these lines are blurred in reality. Are there any other games you’re working on designing, or will you be focusing on expansions to Mythic Battles for now? I am currently finalizing the first expansion of Mythic Battles to be released at the beginning of next year. I am also working on other projects. I will be able to tell you more about them when they will become more concrete. Hopefully it shouldn’t take long. The next set of questions are what we call the 1-Word Response questions. They only require one word (or phrase) responses. Aaaannd GO! Have you ever jumped from an airplane? We’d like to thank Benoit for taking some time to chat with us about Mythic Battles! 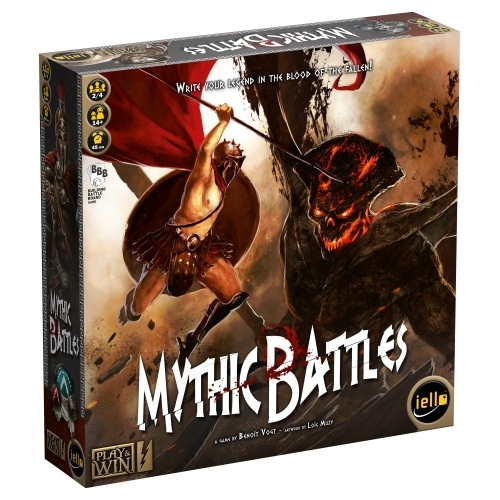 You can order your copy of Mythic Battles through Iello games right here!